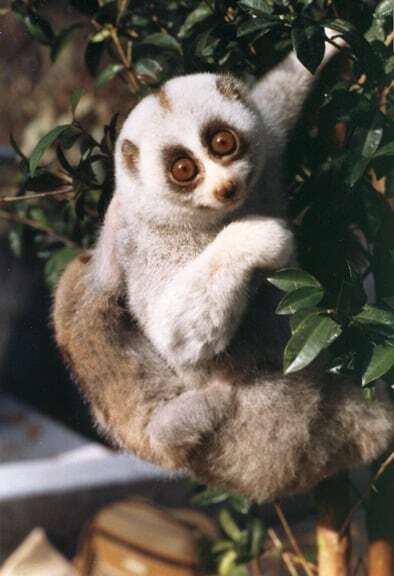 Slow Lorises are a group of several species of primates, varying in colour from grey to white depending on their range, with dark rings around their eyes and a stripe running down their back. There are eight valid types of Slow Soris, each with their own variation in colour. Their strong grasp (with both hands and feet) make them accomplished climbers, albeit unhurried. They can grow up to 38cm tall and range in weight depending on the species, from 250g to 2 kilos. Because they’re nocturnal and live in trees, during the day you’ll usually find the slow loris curled up in a tight ball high in the branches, with their head between their thighs. They stir around sunset and walk slowly on all fours, usually alone, through the forest, the males having a larger range than the females. They’re the only primate in the world with a venemous bite, releasing a flesh-rotting poison that can be fatal to humans. Due to the cute and cuddly, teddy-bear like face of the Slow Loris, they’ve been high on the list of animals poached for Asia‘s illegal pet trade for a long time. Search for the Slow Loris on YouTube, and thousands of videos will pop up of people tickling their pet loris and giving them props to hold. Poachers remove the animal’s teeth either before taking them to the market, or at the point of sale at the buyer’s request. They’re then thrown in cages and exposed to daylight and baking heat, where most of them die before they are sold. The Slow Loris is also know as “the animal that cures 100 diseases,” and is often killed for use in traditional Asian medicine. Deforestation is putting the Slow Loris at an even greater risk. Just 10% of the forest is left on Java, the main island in Indonesia, which has resulted in a massive decline in the slow loris population there. These problems have grown so severe that the three new species of Slow Loris discovered in December 2012 have already been put on the IUCN Red List.